For projects that don't require the rapid stock removal of a belt sander, a random-orbit sander, like the one shown at right, has become the goto tool for most woodworkers. And their versatility is the reason why. They can be aggressive enough to remove a lot of material quickly, or gentle enough for the final sanding on your most treasured pieces. But the biggest advantage of a random-orbit sander is you can sand in any direction without leaving cross-grain scratches caused by moving the sander against the grain. And manufacturers supply an assortment of sandpaper and other abrasives for these sanders (see the box below). HOW THEY WORK. The mechanics of a random-orbit sander are designed to move the abrasive disc in both a circular motion and on an elliptical path in the opposite direction. This helps conceal the swirling marks made by the sandpaper and allows you to move the sander in any direction over the workpiece. RANDOM-ORBIT SANDING TECHNIQUE. Using a random-orbit sander is such a common activity that we assume there's not much to it other than turning it on and moving it around. But there are a few key things to keep in mind. First, and most important, don't press down on a random-orbit sander. You should use your hand to just guide the sander. 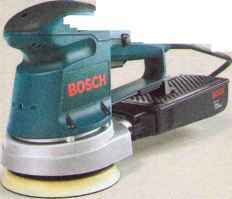 Pushing down actually decreases the sander's efficiency by slowing down the rotation of the disc. 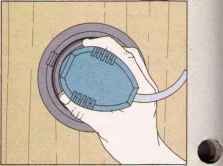 That can cause the sander to dig into the wood, marring the surface. 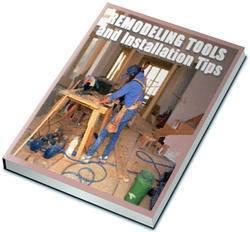 Another common mistake is moving the sander too quickly across the surface. I like to take slow, overlapping passes moving only about one foot in ten seconds. This "feed rate" results in consistent smoothing and reduces the visibility of the swirl pattern left by the abrasive. from the previous sheet. Usually, even on a fairly rough surface, you can start with a 120-grit disc and achieve a smooth surface. Moving through the grits (150, 220, and beyond) involves lighter sanding to make progressively finer and less visible scratch patterns. Don't Push Down. 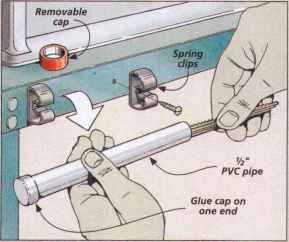 Hold your hand on the side of the sander to guide the tool with the grain.